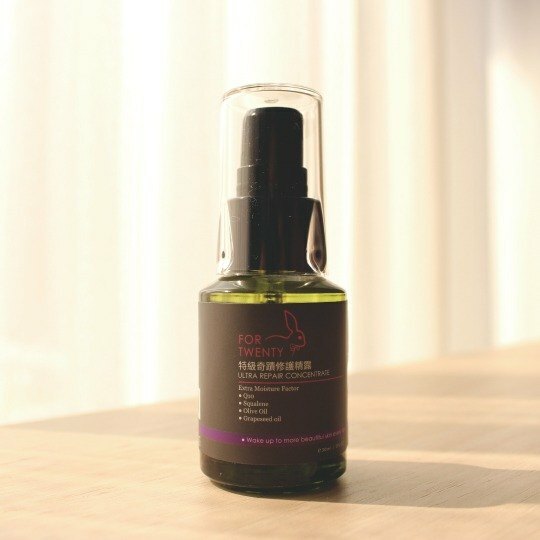 https://c1.staticflickr.com/3/2829/32085188394_83bfdccd69_b.jpg 特級奇蹟修護精露 Ultra Repair Concentrate 30ml 商品簡介 高親膚性角鯊烯(Squalene)：滋養肌膚、修復、使肌膚不乾燥，進而達到除皺作用。 推薦膚況：肌膚蠟黃暗沉、乾荒粗糙 推薦對象：中性偏乾、乾性肌膚、極乾性肌膚 推薦肌齡：輕熟齡~熟齡肌膚 精研熟齡肌膚抗老修復精露，超進化直達肌底97%有感瞬吸。 天然親膚植萃精露，倍速修護老化肌膚。 激活黃金修賦力，明亮、柔嫩、平滑，有感推薦！ 高濃度添加新一代輕油感質地，與人體肌膚表皮油脂成分相同，提供豐沛養分，可瞬間吸收97%，形成天然表皮防護膜，可迅速滲透肌膚直達肌底。高濃度角鯊烯萃集三種油脂精萃，模擬肌膚脂質構造組成，親膚性極佳，能立即深層修護，形成天然肌膚屏障。 讓肌膚迅速形成完美保水基底 只需這一瓶！97%有感肌膚豐潤！ 解決修護、明亮、潤澤、光滑四大煩惱！ 溫和配方，敏感乾燥型肌膚的救星。添加仿生人體肌膚脂質的角鯊烯(Squalene) 質地清爽不油膩且分子細小幫助吸收，只要幾滴，不僅能形成天然隱形防護層提升肌膚保護力及抗氧化力 高效黃金滋養修護力，讓肌膚回復高密度水潤狀態 撫平歲月痕跡，肌膚緊緻彈力度upup，讓肌齡重回20歲，綻放自信光采 萃集三種油脂高度濃縮液 以高親膚性、細緻輕薄且滲透力極佳的植物萃取油，直達肌底修護受損肌膚，並以乾油性質的植萃油瞬間在肌膚表層打造一道隱形透氣保護屏障，幫助鎖住前段保養精華，並同時釋放精華高效成分，使精華持續滲透，深達肌膚底層進行密集作用，改善肌膚緊實度、加強肌膚彈性，提供長時間溫潤修補而無油膩悶感。 特色簡介： ●平滑除皺，直達肌底深層吸收 ●一滴抗老：能量修護，賦活肌底 ●肌膚強化：協調作用，肌層屏障 ●Q彈柔嫩：特效修護，恢復彈嫩 ※重點原料介紹 【鮫鯊烯】 鮫鯊烯為人體本身自然生成的物質，保持皮膚滑潤的作用，廣存於組織器官與皮脂層內可供給活性氧分子，提高細胞活性化，能緊緊鎖住肌膚表層與深層的水份，隨時維持肌膚的保濕能力，具有抗自由基離子功效，能促進養份轉化形成能量，構成肌膚天然防禦系統降低老化及紫外線刺激，抑制彈力蛋白分解酵素，滋養肌膚、修復、使肌膚不乾燥，進而達到除皺作用。 質地：清爽不黏膩 吸收度：吸收更快，立即滲透至肌膚底層 滋潤度：適度滋潤乾燥肌膚，長效保濕，使肌膚油平衡 功效：由肌膚底層開始完美協調作用，更高效修復及修護受損肌膚。全面啟動抗老機制，抵禦外在環境刺激，完善撫平肌膚皺紋 產地/製造方式 產地台灣，無防腐劑，天然植萃系列 使用方法： 清潔過後怎麼用：洗完臉先拍上化粧水，手心取適量（1∼2下）溫熱後，從較易乾燥的兩頰、唇周塗抹至全臉，記得最後再擦上乳液/乳霜鎖住水份。亦可當作按摩油使用時，增加使用量即可。 上妝之前怎麼用：取1-2滴於掌心，輕柔塗抹於全臉及頸部，在上妝前使用可為後續底妝打下完美肌底，讓底妝擁有前所未有的服貼自然,充滿透亮光澤。 注意事項： 本產品不含Paraben防腐劑、不含SLS界面活性劑、不含人工色素、人工香料成份。 請放置於陰涼處，避免高溫或陽光直射，以免產品變質。 如不慎清洗時觸及眼睛時，請用大量清水沖洗。 https://c1.staticflickr.com/5/4161/34220120816_ce1bd31654_b.jpg - **Ultra Repair Concentrate 30ml** ● Wake up to more beautiful skin every day. Extra Moisture Factor ● Q10 ● Squalene ● Olive Oil ● Grapeseed Oil Ultra Repair Concentrate reveal a smoother, more radiant, younger look and dramatically reduces the look of all key signs of aging.It maximizes the power of skin's natural nighttime renewal with our exclusive Ingredients. ※Lines and wrinkles look significantly reduced.※Skin looked more youthful in just few weeks.※Skin feels smoother, hydrated, stronger.※Skin is immediately hydrated. ※Skin looks younger, radiant, more even toned. ※Skin looked healthier, fresher, more rested. Terra Series ● Preservative-free ● Alcohol-free ● Free of artificial colors Usage： - Apply 2-3 drops of treatment on cleansed skin. - Gently press fingertips to cheeks, forehead, and chin to evenly distribute the application before gently massaging it into the skin. - Can wear alone or under moisturizer. Storage： Store at cool place,avoid direct sunlight. Best Before： 3 years. Production Date： Please see the label attached.